addressed to Lukasz Kurgan (lkurgan@ece.ualberta.ca). sequences and the number of known structures. our method achieves 14.3 mean absolutestructure of proteins [6-8]. The knowledge of three dimensional protein struc-13-15]. form of the PSSM profile to generate features [18, 19]. would indicate the quality of the predicted RSA value. a target residue and thus it consists of 300 features. 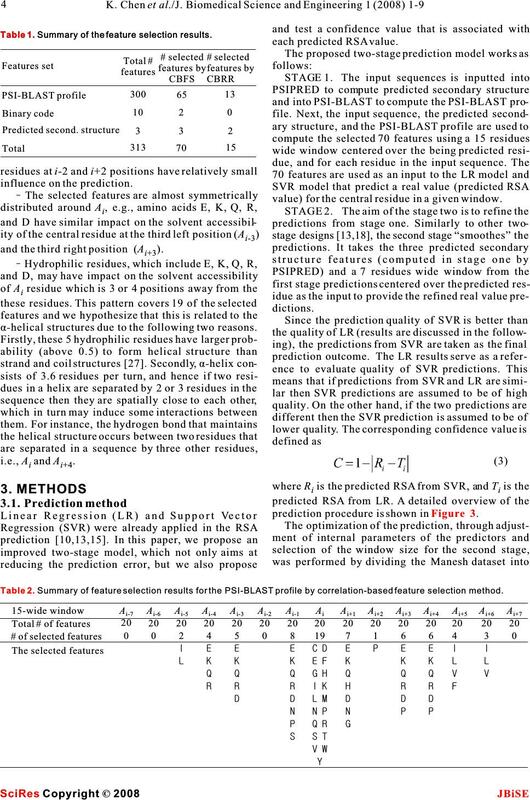 method that minimizes the RSA prediction error; (2) secondary structure prediction results . 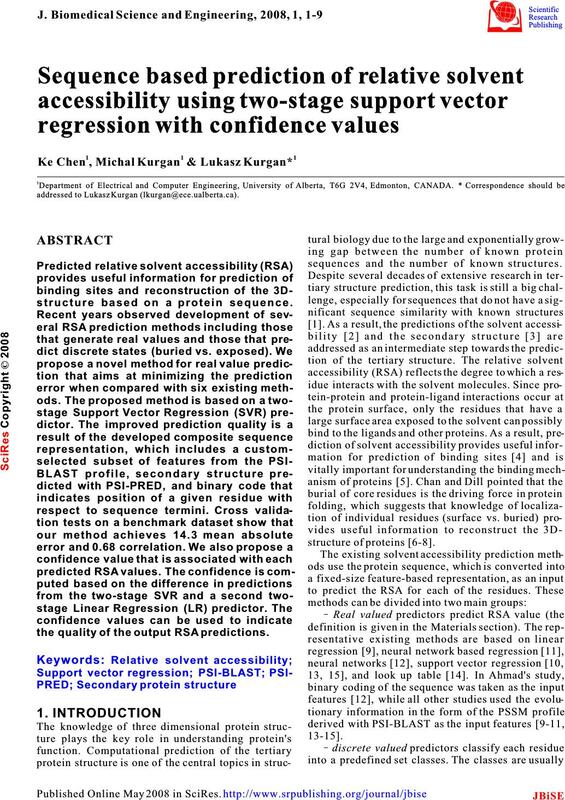 the method should provide a confidence value that Secondary structure predicted with PSI-PRED. fied prediction model, reduced computational time,RSA prediction method. use it to design and validate our method.sequence is encoded as (0,0,0,0,0,0,0,0,0,0). last position in the sequence, see. The selected features are almost symmetricallyvalue) for the central residue in a given window. and the third right position (A). these residues. This pattern covers 19 of the selected dictions. 3.1. Prediction methodprediction procedure is shown in . Table 1. Summary of the feature selection results. 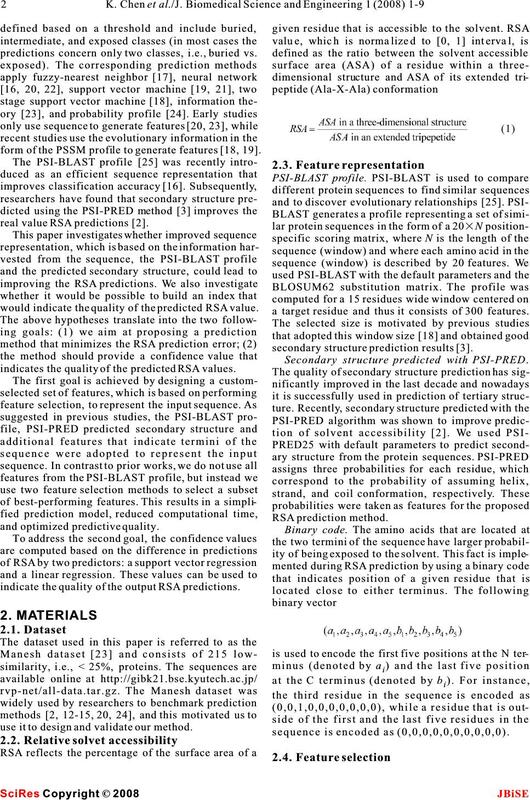 Table 2.Summary of feature selection results for the PSI-BLAST profile by correlation-based feature selection method. tion. For SVR, RBF kernel was used for both stages. of 7 is the best choice to provide accurate predictions. Table 3.Optimization of parameters for two-stage SVR. error ofx for a given hyperplane, and z=(x)wherePearson's correlation coefficient (r) equals 0.67.
posed method was compared with six real value RSArate two states predictions. However, as elucidated by  and demonstrated innetwork and look-up table based methods [14, 20, 24]. 4.1. Comparison with competing prediction between 5 and 50%. vs. exposed) with different threshold (5%~50%); unreported results are denoted by “-“; best results are shown in bold. i.e., the differences range between 4% and 5.8%, and two-stageSVRareassumedtobemoreaccurate. 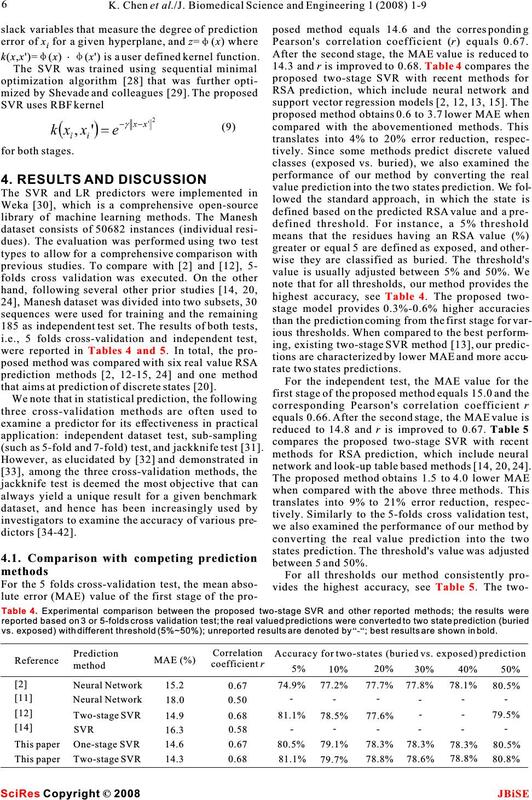 on results of five folds cross-validation tests. desired fraction of best performing predictions. results are denoted by “-“; best results are shown in bold. residues cover 14% of the dataset. metrically distributed around the predicted residueMedicine and Biology, Shanghai, China, 2005.
set of the predictions which on average are character-accessibility using fuzzy k-nearest neighbor method. 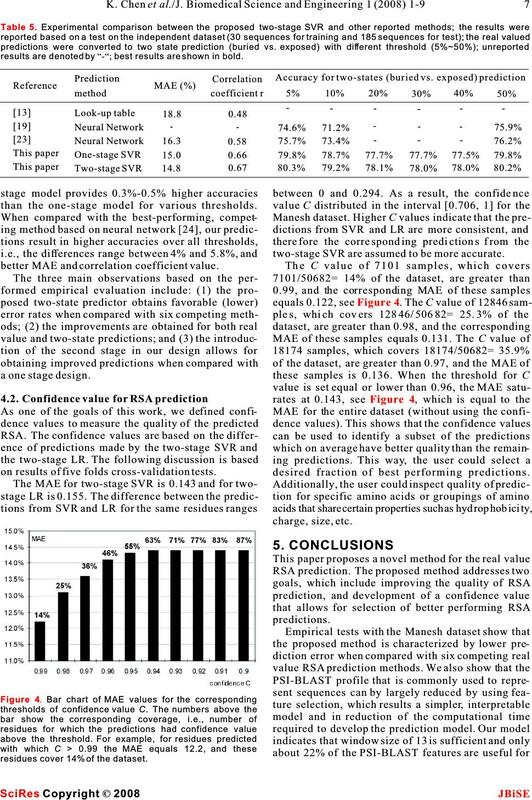 ized by better quality than the remaining predictions.Bioinformatics 2005, 21(12):2844-9.
tive solvent accessibility with a two-stage SVM approach. predicted by the proposed method and which areProteins 2005, 59(1):30-7.
protein function and stability [43, 44], for predictioninteraction 3D local descriptor. Proteins 2004, 54(3):557-62.
anism of proteins , reconstruction of the 3D-18(6):819-24. Naderi-Manesh, H., Sadeghi, M., Araf, S.& Movahedi, A. A.
ACKNOWLEDGMENTS tion theory.Proteins 2001, 42:452-459.
acknowledges support provided through scholarship sponsored by diction of solvent accessibility by probability profiles. Alberta Ingenuity Fund.Protein Eng. 2003, 16(12):987-92. 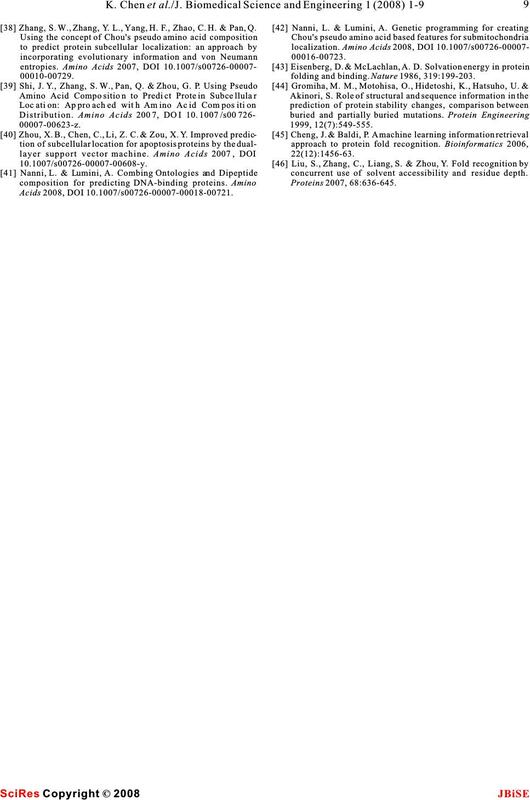 Ginalski, K. & Rychlewski, L. Protein structure prediction of grams,Nucleic Acids Res. 1997, 17:3389-402. Proteins 2003, 53(Suppl. 6):410-417.Research.2004, 5:1205-24. Jones, D. T. Protein secondary structure prediction based onComputational Biology, 2006, 366-72. Huang, B. & Schroeder, M. LIGSITEcsc: predicting ligand 1998.
vation. BMC Struct Biol. 2006, 6:19.Improvements to SMO Algorithm for SVM Regression. Chemistry 1988, 30: 3-48of Singapore, 1999. 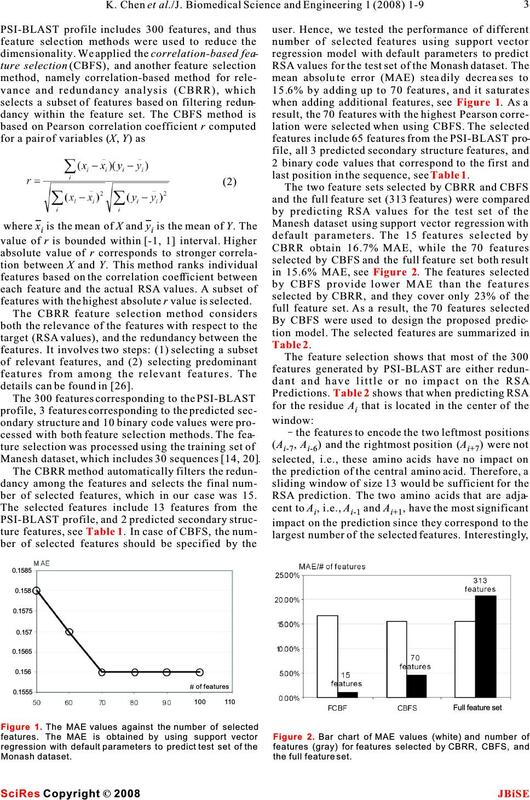 Wang, J. Y., Lee, H. M. & Ahmad, S. Prediction and evolution-2005. Arauzo-Bravo, M. J., Ahmad, S. & Sarai, A. Dimensionality of Molecular Biology 1995, 30:275-349. Wagner, M., Adamczak, R., Porollo, A. & Meller, J. Linear various organisms. 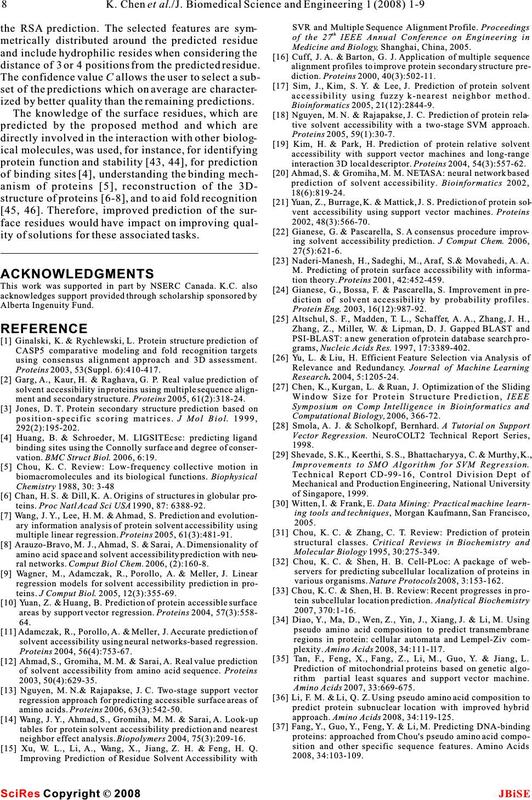 Nature Protocols 2008, 3:153-162. Yuan, Z. & Huang, B. Prediction of protein accessible surface 2007, 370:1-16.
solvent accessibility using neural networks-based regression.plexity. Amino Acids 2008, 34:111-117. Proteins 2004, 56(4):753-67. Tan, F., Feng, X., Fang, Z., Li, M., Guo, Y. & Jiang, L.
of solvent accessibility from amino acid sequence. 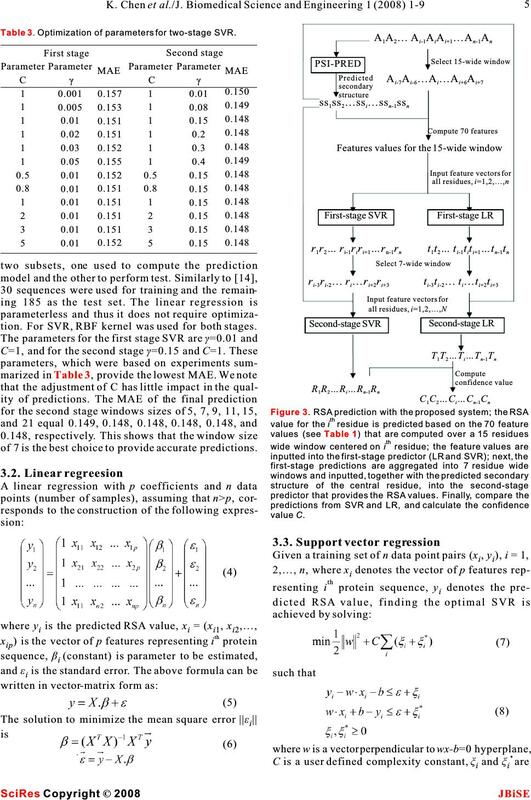 Proteins rithm partial least squares and support vector machine. 2003, 50(4):629-35.Amino Acids 2007, 33:669-675.
amino acids. Proteins 2006, 63(3):542-50.approach. Amino Acids 2008, 34:119-125. Xu, W. L., Li, A., Wang, X., Jiang, Z. H. & Feng, H. Q.2008, 34:103-109.
incorporating evolutionary information and von Neumann00016-00723. 00010-00729.folding and binding.Nature 1986, 319:199-203.
layer support vector machine. Amino Acids 2007, DOI 22(12):1456-63. Nanni, L. & Lumini,A. Combing Ontologies and Dipeptideconcurrent use of solvent accessibility and residue depth. composition for predicting DNA-binding proteins. Amino Proteins 2007, 68:636-645.